I was invited to participate in a YouTube card making video collaboration with 25 other creators. We are each producing a card making video — a card for a guy. There are some great prizes available for the viewers, but you have to watch each video and collect a secret word. The final video in the series releases on on Sunday, June 5th and will contain instructions on how to submit your entry along with the complete list of secret words and hopefully win big in a Rafflecopter giveaway! Here’s my video, but note that there are other videos before and after mine! Several folks have asked for more information about the specific materials I used, so I’m following up the video with a blog post that has all the details and even share some of the files I made in case you want to make a similar card. I picked up the Bazzil cardstock at Tuesday Morning for $3. It’s a 216 gsm/80 lb card stock with nice texture. Unlike some other textured cardstock I’ve tried, it cuts well and releases from my cutting mats nicely. The Recollections cardstock from Michaels is among my favorites. It often goes on sale for $2 or $3 a pack, it cuts well, and there are lots of color coordinated packs to choose from. You probably already know all this, but I mention it just in case my mom is reading. Hi Mom! Kraft Cardstock… It has no label, but it’s kraft cardstock. It looks cool when printed on in black and white. Neenah Exact Index is my all-purpose, utilitarian favorite. It’s cheap, good, and comes in big 250 sheet reams, both in 90 lb/163 gsm and 110 lb/199 gsm weights in your choice of letter, legal, or ledger sizes. Bam! The 90lb letter size ream fluctuates in price between $5 and $8.50, but it’s still a good value at the higher price. It’s my go-to whenever I’m testing cuts or even print designs because its smooth texture works well in laser and inkjet printers. It get mixed results when foiling it, but they have different lines of paper I eventually want to test with foiling. 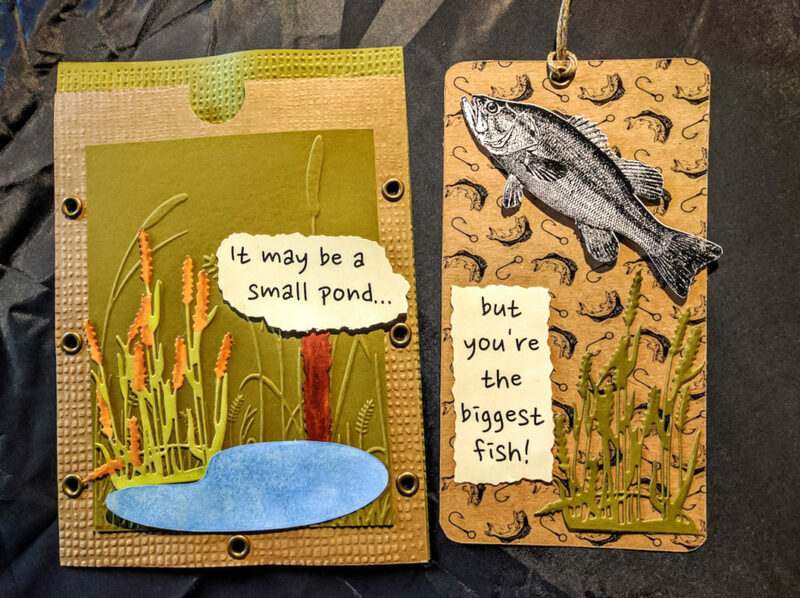 The Spellbinders “Cattails” die and Darice “Grass” embossing folder were used as accent pieces. The real star of this piece for me is Tammy Tutterow’s “Horsehair” embossing folder from Spellbinders. It imparts such a visually interesting and tactile-gasmic texture to card stock. Its effect on the paper was transformative. Spellbinders makes it look all grungy, but it feels like lux fabric in the hand. As promised, here is a zip file that contains the basic card assets. The card back, front, front panel, and tag insert are included as SVG files. The big fish comes as a transparent PNG, which can be used to create a print and cut image whether you’re using Design Space, Sure Cuts a Lot, Make the Cut, etc. The text, which uses the Nanum Pen Script font, is also included as a PNG. The “Off the Hook” digital paper comes ready to print on any 8.5×11″ material that can make it through your printer. Enjoy! That seems to be just about everything. If anyone has any questions or comments, I’d love to hear from you! All the YouTube comments have been so positive and encouraging and I greatly appreciate all the positive feedback. Thanks again to all of you and thanks to MayMay Helms and Gareth Frewer for inviting me to be a part of this collaboration! Don’t forget to watch the rest of the videos and play along with the little game. You could win prizes! Free stuff! I know what the prizes are and you should totally play. Enjoy the other videos!